Most of mainstream users are using mouse gestures in their browser without any customizability. 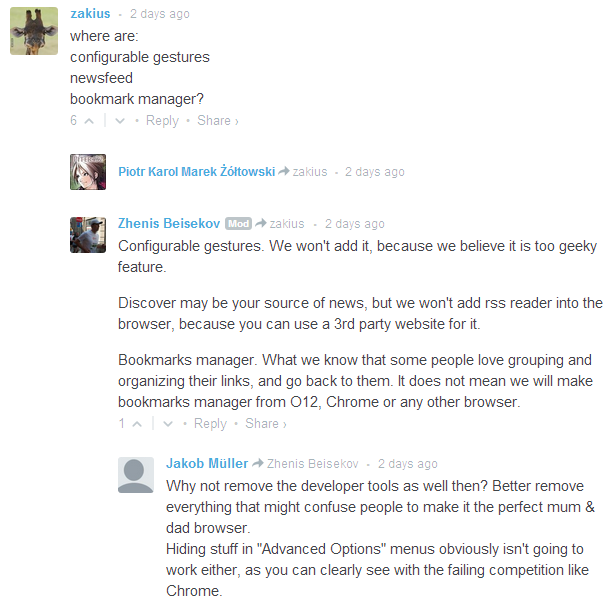 New Opera won't be oriented for users who prefer customizability and other "geek" complicated stuff such as bookmark manager. I installed "Download Chrome Extension" and then the Chrome extension "Smooth Gestures". I disabled Opera mouse gestures and set my costum ones in "Smooth Gestures". In addition I installed 'Tab Position Options' and set it to 'last active tab'. They won't ever add customizable mouse gestures for being "too geeky"? Are they idiots? Are they aware that the Opera's userbase is Power Users only? @skjern yeah, that's cool and all, but you're using extra RAM things that should be included by default. Personally I refuse to install extensions for things I just need one functionality - in my case that's "reopen closed tab". Now I have to go to Menu > Recently Closed tabs, which are three clicks + moving the mouse all across the screen, where before it was just right click, gesture, release. Are they aware that the Opera's userbase is Power Users only? There is no way for you to say if it's true. In my personal opinion, they don't care about power users anymore! They drastically changed ideology of their browser. That's why Chr... Opera is nothing to do with Opera besides logo(icon) and brand name. Why would you want to minimize a tab instead of simply switching to another one? Opera are now assuming that their users are idiots. You might as well just use a different browser, because any Opera version above 12.17 is just a tangibly inferior version of Chrome. No... just some users would be considered such. You know... type who troll the forum looking to start trouble. for me it was also that functionality that was missing, and the addon does the trick.